So you know the sage office advice never to date colleagues in the same office? Well, apparently that doesn't hold true for Singapore workers any longer. A new survey has revealed that 8 in 10 Singapore office workers gave the "thumbs up" to office romances. Given that office staff spend most of their waking hours in the office, employment firm JobStreet.com Singapore recently conducted a survey to find out if the workplace is a viable option for singles to find love. Here are the results: 8 in 10 office staff surveyed agreed it was easier to find a partner within the workplace and felt that office romance should be allowed between single co-workers. 32% of them admitted to dating a co-worker at least once in their career while 13% admitted to dating co-workers at least twice. 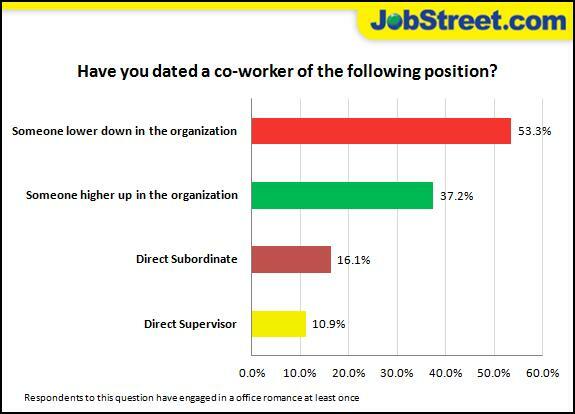 But here's the catch: 75% of office staff surveyed admitted to keeping office romance under wraps. Only 17% felt comfortable enough to be opened about the office romance with their direct superiors from the start, and 7% were prepared to inform colleagues and management only when the relationship got serious. A total of 315 Singaporean employees and 100 employers took part in the survey that was conducted by JobStreet.com last month.